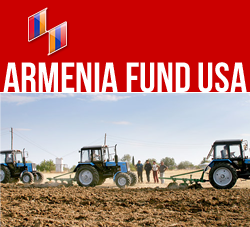 New York, NY — The Hayastan All-Armenian Fund continues to assist the Syrian-Armenian community, with financial contributions made by various fund affiliates since the beginning of 2014 as well as proceeds from the Fund’s 2013 Telethon. A total of 100,000 euros raised by the French affiliate will benefit various Syrian-Armenian-relief projects through the Catholicosate of the Great House of Cilicia. Contributions by the fund’s German affiliate, totaling 35,000 euros, have already been transferred to the Syrian-Armenian Emergency and Rehabilitation Committee. In addition, of the funds raised through the 2013 Telethon, 15 million Armenian drams will be allocated for continuing to address the social, healthcare, and education needs of Syrian-Armenian families currently residing in Armenia. The assistance will include the defrayal of student tuitions as well as the costs of surgeries and funerals. Program beneficiaries are selected by the Ministry of Diaspora. Reminding that Armenia-based and diaspora benefactors and organizations that have contributed to the cause include Hirair Hovnanian, Ara Abrahamyan, Petak LLC, HayRusGasArd CJSC, the Galustanian Raffi Charitable Center, Judges of the Republic of Armenia, RA NAS Institute of History, Banants Football Club, Kara-Murza State Musical College of Gyumri, Turvand LLC, and others. The Fund has used the contributions to implement a range of healthcare, educational, and social-assistance projects. As of June 2013, the fund has provided the following amounts in assistance to the Syrian-Armenian community: One hundred thousand euros raised by the French affiliate, 12,000 euros from the German affiliate, and USD 100,000 from the Lebanese affiliate have been used essentially to pay the salaries of teachers at Aleppo’s Armenian schools. Contributions from the Brazilian, Argentinean, and Swedish affiliates have been used to cover the tuitions of 110 Syrian-Armenian students attending various colleges and universities in Armenia; to pay for the heart surgeries of six Syrian-Armenian individuals; and to cover the cost of funerals for three others. The amount of 10,000 dollars raised by the US Western Region affiliate has been donated to Yerevan’s Kilikian School, which has opened its doors to children from Syrian-Armenian refugee families. As for contributions made by industrialists Hirair Hovnanian and Ara Abrahamyan, they have been used to pay for refugee flights between Aleppo and Yerevan.